What began as a record-setting streak for U.S. stocks fizzled as the week progressed, with the Dow Jones Industrial Average approaching and ultimately falling short of 20,000, as the biggest driver of the post-election rally declined. 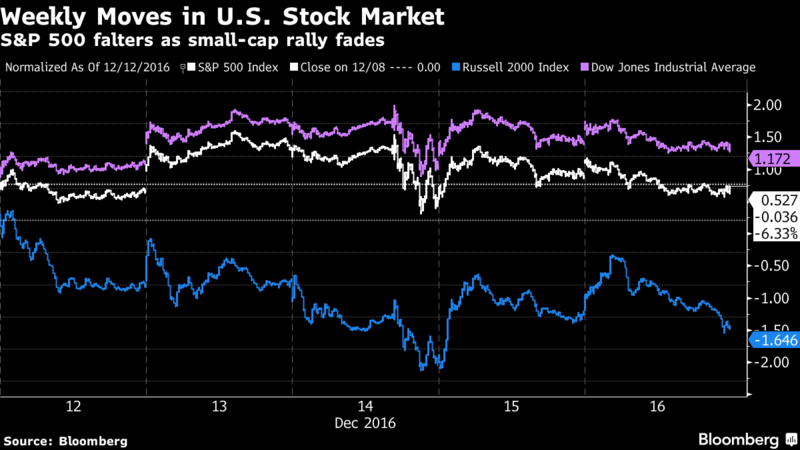 Financial firms decreased for the first time since Donald Trump’s presidential victory, ending a five-week advance in which the group propelled benchmark indexes to records. The S&P 500 Index lost 0.1 percent to end at 2,258.07, while the Dow average climbed within 0.45 percent of 20,000 before ending at 19,843.41, a gain of 0.4 percent for the five days. Even with this week’s drop, banks remain the market’s hottest industry since Trump won, rising more than 20 percent since just before the election, compared with 13 percent for the next-best group, energy producers. 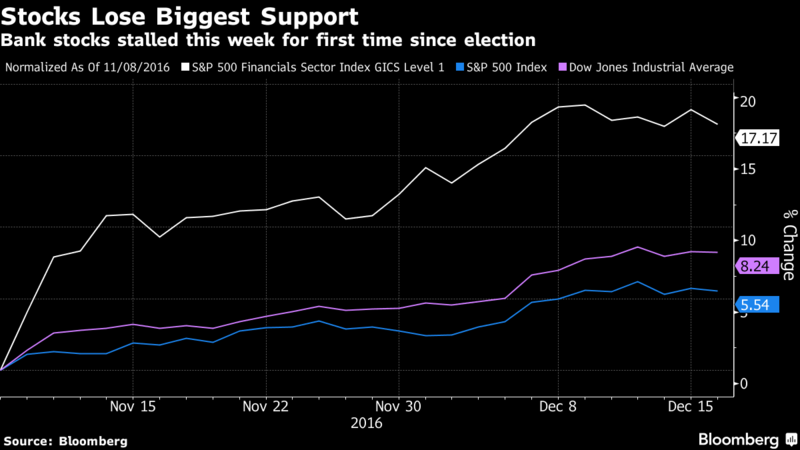 Gains of more than 20 percent in Goldman Sachs Group Inc. and JPMorgan Chase & Co have taken the Dow up 8.3 percent since the election, compared with a 5.5 percent gain in the S&P 500. Both fell more than 1 percent this week, including losses on Friday after China seized an unmanned U.S. drone in the South China Sea. Instead of financial shares, telephone and utility companies rallied on the week, each climbing at least 1.8 percent. Utility shares, the biggest laggard in the market since the election, advanced even as the yield on the 10-year Treasury note climbed 13 basis points to 2.59 percent after the Federal Reserve raised interest rates by a quarter-point.